It was the best of times. It was the worst of times. It was the worst race ever. 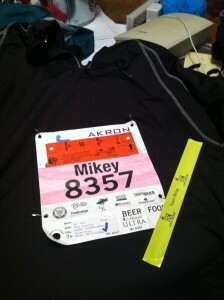 Note and spoiler alert: This is not intended to be a recap of the Time Warner Cable Akron Marathon weekend. 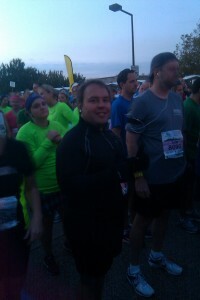 One year later I would go on to run my first Akron Half Marathon. I enjoyed the event so much that I went on to run the 2014 Akron Half Marathon and the 2015 Thirsty Dog 8k, and just may be running a few more of their events later in 2015! September 29, 2012. Akron Ohio. Oh boy, here we go. Just over 10 months after I began my Casual Running adventure, I was about to toe the line at my first race. I did not yet know it, but I was about to fail miserably. Don’t worry, this is not a sad story per se. But it is a reminder that, in Casual Running, as in life, we will not have good days every day, we will have setbacks, and the true mark of our determination is how we endure and overcome the challenges we encounter along the way. As I spent the winter, spring, and summer training and gradually increasing my distances, friends and family alike kept asking me when I was going to enter a race. My answer remained the same: “I am just not ready yet.” I convinced myself that I would not enter a race until I knew that I could run the entire distance of the race because I, quite frankly, was afraid of failing and embarrassing myself. (Boy how wrong I was, but more on that in a later blog: Finding Motivation in the Fear of Failure). 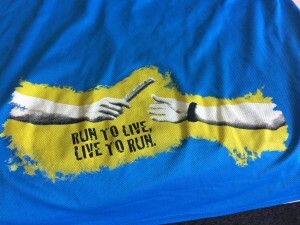 2012 Akron Marathon Relay T-shirt Logo, passing the baton, er, slap bracelet. Having worked in downtown Akron for several years, right across the street from the finish line to the Akron Marathon, I saw how much the community embraced and celebrated this event. When my brother Frank asked me to run the half marathon, I laughed at him. 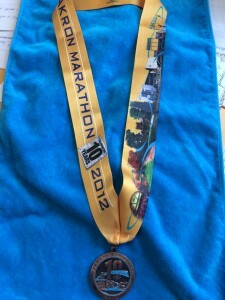 There was no way I could do a half marathon – ever. (Again, how wrong I was about that, but again, more on that in a later blog). Over the years my brother had asked me to run several races, he even offered to pay my entry for a 10k, but time and time again I dismissed his overtures. For the first time, I was about to say yes. (Actually, he still owes me a Christmas present as he gave me a 10k race entry as a gift one year and I never took him up on the offer, so if you should see him, please remind him of this). One day my brother asked me if I would be interested in putting a marathon relay team together. I am not going to lie, the fact that running a relay would give me a medal was a huge draw. This was the beginning of what would become an irrational obsession with SMOs – the “shiny metal objects” that you get when you finish a “real” race. I told him, “sure,” but insisted that I would have to run one of the shorter legs. We found 3 other willing souls to run the remaining legs, and my brother suggested that I run the 3.9 mile opening leg so I could experience what it was like to toe the line at a big race. I figured, “sure, I can do that.” I was already running 5k distances regularly in my training, so what was an extra .8 miles? So we signed up for the relay event of the Time Warner Cable Akron Marathon. My first race outfit, bib, and slap bracelet. Heading into the race I was feeling confident. In fact, I even signed up for not one, but two 10ks in the month following the Akron Marathon Relay. I had caught the bug and there was no stopping me. Yeah, about that….as Lee Corso is apt to say…“not so fast my friend!” I was not prepared for the worst race ever. 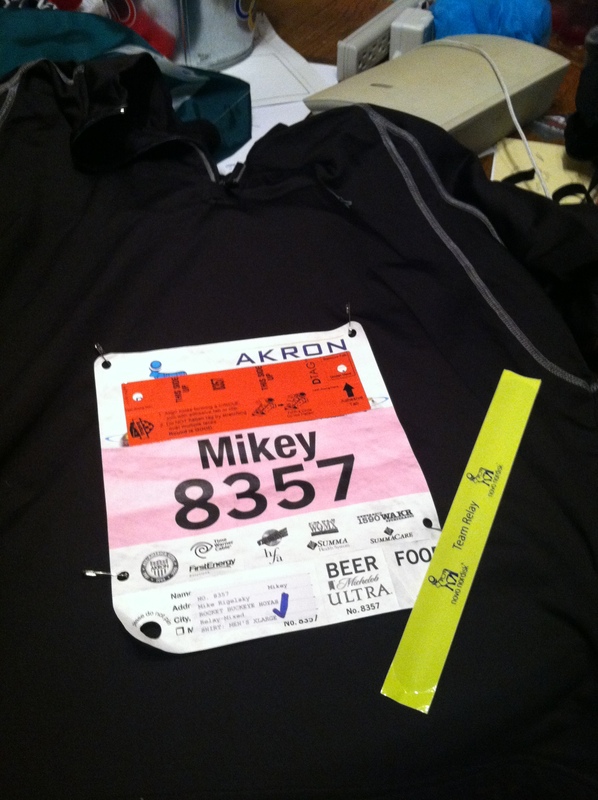 Full disclosure: this is not an affront to the good folks who run the Akron Marathon. Really, it’s not you, it’s me. 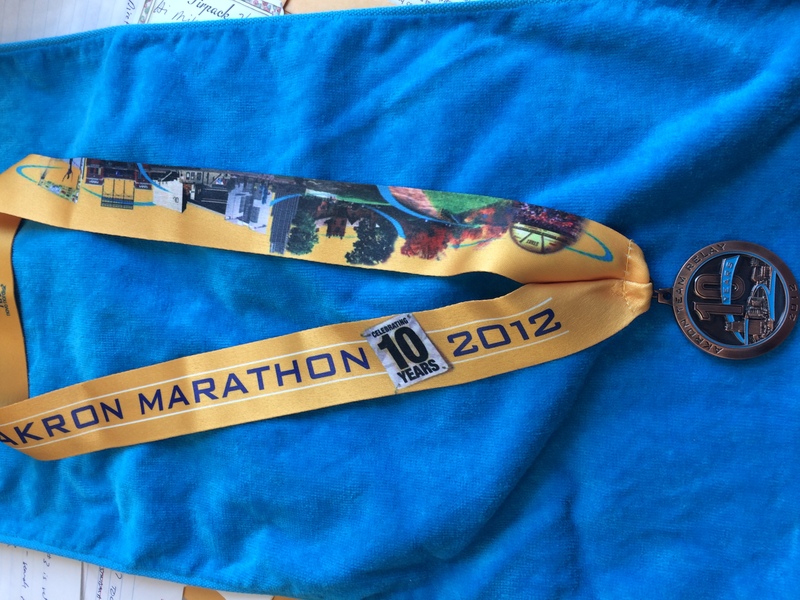 As I will discuss in a later blog, the Akron Marathon is a great event, the race did not fail me. This statement has everything to do with how I failed the race. The night before the race I checked the weather forecast and saw that the temperature would be in the low 50’s and decided to dress warmly, very warmly in fact. I put together an outfit that consisted of a long sleeve, cold weather shirt (sort of a low-tech, tech shirt I wore as a base layer for snow skiing), a tech undershirt, and long running pants. Because this was not enough, I also put on running gloves and a cold weather headband. I had done absolutely zero research about how to dress for races, and as such I had no idea just how over-dressed I would be for this event. Additionally, at that point in my training I was running exclusively in Fila Skeletoes, which I still love. However, I had spent the prior 5 months running almost exclusively on a running trail that consisted primarily of dirt and crushed gravel, not on concrete. The entirety of my 3.9 mile relay leg would be run on concrete. Ready to the tow the line at my first race…at least I was not cold. Was I experienced enough to consider the implications of this? Absolutely not. It never even entered my mind. I would later find out that the constant “slapping” of these shoes on asphalt was not nearly as comfortable as using the shoes for trail running, I did not know how to adjust my stride for using them on asphalt, and I could hear the slapping noise of the shoes hitting the pavement over the music playing in my earbuds. I showed up at the starting line and met up with some friends for the obligatory pre-race photos. It was a blast. My friends, who were running different events, and my brother/relay-teammate, all knew how much it took for me to get to this point in my training just to enter a race, and they could not have been more supportive. I was on top of the world. The mass start threw me. While I had selected a pacing group with which I was comfortable, I did not understand how this whole “thing” worked. When the gun sounded, people started jogging in place and brushing up against the people in front of them, trying to get them to move forward even though there was nowhere for them to go. I stood there confused, and frankly, a little annoyed at those nipping at my heels from behind. I slowly made my way towards the starting line, the anticipation mounting and the waiting getting very annoying. It probably only took me a few minutes to get to the starting line, but it seemed to take forever. I planned on running with my IPhone in a cheap off-brand armband. I could not even tell you what model it was, but even though I had not trained with the armband, for some reason I thought that it would be a good idea to run the race with it. As I approached the starting line, I fumbled with starting my running app and my music. I stopped walking and stood off to the side as it was the only way to both start my running app and my music. I put my gloves back on and was on my way across the starting line. 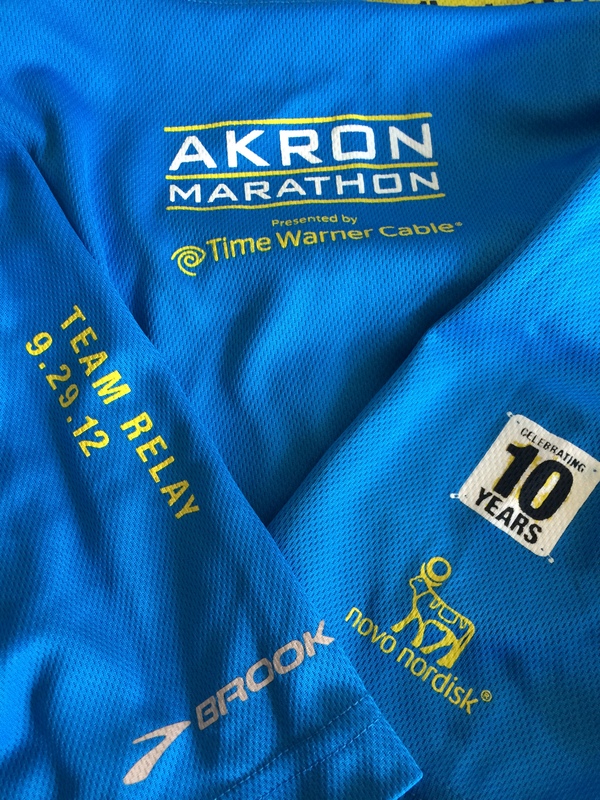 The Akron Marathon relay t-shirt, it was the 10th anniversary of the event. The first half mile was awesome. I was full of adrenaline, weaving in and out of the pack of runners, making great time and having a blast in the process. The first major feature of the race is leaving downtown to the north, where the course crosses the Y Bridge. I found myself in the middle of the 2 lane road as I did so, when I was suddenly trapped behind a group of 7 women, walking arm-in-arm, blocking the majority of the two lanes. I was running at about a 10:30/mile pace for nearly a mile (which was way too fast for how I had trained), which means these women had to have started the race significantly ahead of me because they were not moving quickly at all. I was angry and frustrated because I had to stop and take some time to get around this obstacle. It never occurred to me that such things occur in a race, and I let it get to me rather than merely rolling with the punches. I was thrown off my game, my adrenaline was gone, and then I started to over-think everything. I knew that I was running too fast. But I did not see any distance markers or clocks on the course…I had no idea how far I had run…with my IPhone in an armband I could not see the distance on my running app…I was using a new playlist that I had never run to before so I could not use the songs to gauge how far I had run…what was going on? Aside from the armband with which I was not familiar, I could not operate my IPhone controls because I was still wearing my gloves, and it never occurred to me to take them off. Everything seemed like it was falling apart. As I started up a slight uphill climb and I became exhausted, I was overheating from wearing too much clothing, my lungs were burning, my legs were aching. This made no sense to me, and frustration started to set in. The course rounded a bend in a neighborhood, and I saw confusion up ahead. I quickly realized that course officials were trying to direct the flow of runners to the opposite side of the road to allow an ambulance to access a runner who had fallen on the course. My heart broke for the runner as I had no idea how serious his condition was, but I knew that it was bad enough for them to bring in an ambulance. That was when I started to argue with myself. I was not enjoying myself at all and I just wanted to stop. I actually told myself that since I had another 10k race in two weeks, it would be OK if I stopped and just walked the rest of my leg. The only reason I did not do so was because I knew my brother was waiting for me in the relay exchange zone, and if I walked, then he would know that I had given up, that I had failed. Thus, for the first time, I learned just how power of a motivating factor the fear of failure would be for me. I could have done so many things. I could have taken off my gloves…removed my outer shirt…taken off my headband…removed the IPhone from the armband…slowed my pace…not let the walkers who were in my way bother me…but none of this occurred to me. I just suffered and pressed on. As I neared the relay exchange zone, I spotted my cousin Brittany in the crowd. This was my first ever experience with unexpected magic. I did not expect her to be there (I had no idea that she and her sorority were volunteering at the event), and that momentary excitement of seeing a familiar face gave me the shot of adrenaline that I needed to run the last several hundred yards. There was no way I was giving up now, I may not have run “my race,” but I was going to finish strong. Standing there in the relay exchange zone, ready to take the slap bracelet from me, was my brother. He did not care about my time or my pace, he was proud of me for having finished. Even though it was only 3.9 miles, I felt as though the course conquered me that day. But in reality, although I did not enjoy myself that day, I did not give up, and, in the end, that is really all that mattered. To this day that relay medal hangs separate from all of my other SMOs. To me it has a different meaning. On that morning in Akron, Ohio I learned that, even if you do not get what you expect out of a race, as long as you learned something from the experience, it is worthwhile. That day I learned the powerful motivation that is the fear of failure, and the importance of not giving up, no matter what those voices in your head are telling you. It may have been the worst race ever, but that means that they could only get better from there. Do you have a “worst race ever” story to share? Please let us know in the comment section or contact us via email, Facebook, or Twitter using the links below. Pingback: The Casual Runner | Where are all of the Starting Lines?